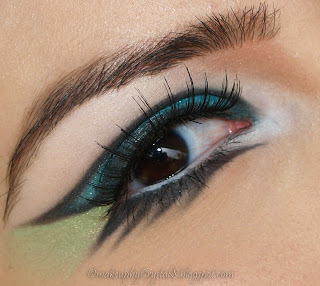 Crystal S has some imaginative eye makeup inspired by the Cheshire Cat from Tim Burton's Alice in Wonderland. Something you might wear to a party. If this Alice in Wonderland game for the Android is what I think it is, I'm still OK without an Android phone. Disney has announced the release date for the DVD: June 1. Here is a list of the special features. Finding Alice – It’s all things Alice. This featurette includes Tim Burton’s vision for the characters, differences from the book and Disney’s version of Alice and how she evolves as both a character and actor as she takes an adventure through Wonderland. The Mad Hatter – Audiences are provided with a deeper look into the world of the Mad Hatter. Check out Johnny Depp’s early sketches, make-up, costumes and how they digitally enhanced his eyes. Effecting Wonderland – A behind-the-scenes piece on the different technologies used to create some of the most beloved characters in the film – Stayne, Tweedledee, Tweedledum, Bandersnatch and the Red Queen. The Futterwacken Dance – Futterwhat? Check out the making of the timeless dance called the Futterwacken. The Red Queen – The creation of the Red Queen from start to finish, including early Tim Burton sketches showcasing costume designs, make-up and digital effects. Time-Lapse: Sculpting the Red Queen – A short time-lapse piece showing Helena Bonham Carter as she gets her make-up done. A three-hour process can be watched in just a few short minutes. The White Queen – An interview with Anne Hathaway, who plays Wonderland’s good queen, about her character’s journey throughout the process of the film. Scoring Wonderland – Composer Danny Elfman and Tim Burton discuss the music for the movie. Stunts of Wonderland – A featurette highlighting some of the biggest stunts in the film. Making the Proper Size – An inside look at the visual effects process of growing and shrinking Alice. See how filmmakers used different techniques to stay true to the storyline. Cakes of Wonderland – Take a trip to “Cake Divas” where the creators of the EAT ME cakes provide viewers with details about how they made the smallest crumb to the largest cake in scale. 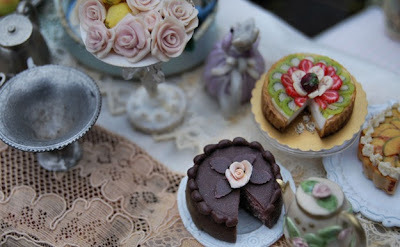 Tea Party Props – Tea cups, saucers, cakes and more. Prop master Doug Harlocker gives an overview of all the props used to bring the famous tea party scene together visually. For the crafty readers: Here are some nice Alice inspired embroidery patterns. Check here for interesting Alice charm bracelet ideas. 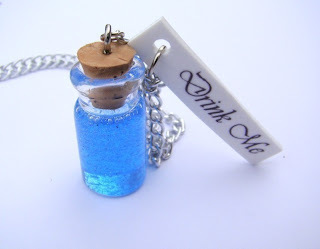 Cool "drink me" bottle necklace and earrings in NeliaTenlion's Etsy shop. While we're on the topic: There is a ton of Alice in Wonderland stuff on Etsy. Every once in a while I go and check it out, and leave immediately because I'm overwhelmed. Today's search came up with 11,881 items! A person could do a blog just on Alice in Wonderland stuff on Etsy. 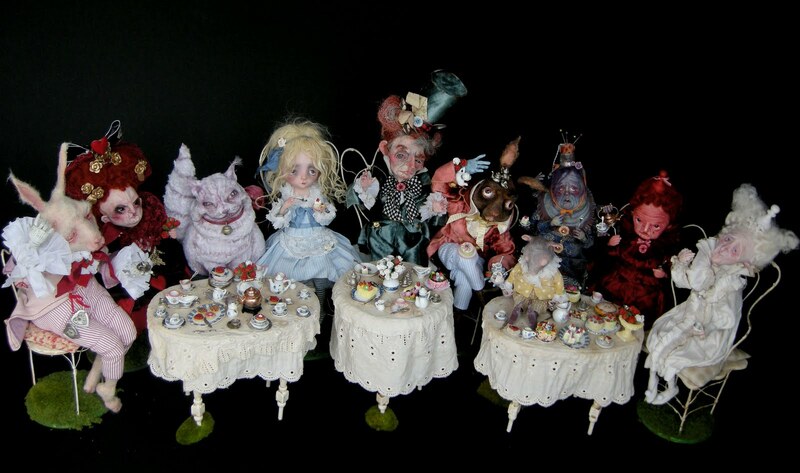 Superpunch has helpfully assembled photos of a collection of Alice in Wonderland dolls created by Julien Martinez. 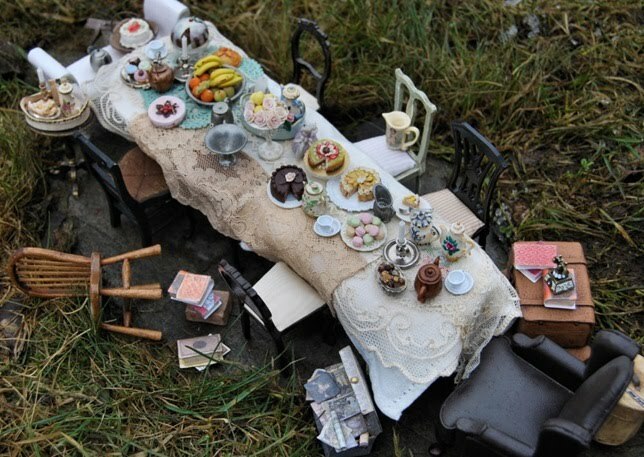 Don't miss the Tea Party. Mad Hatter and Cheshire Cat . Norwegian Miniature artist Christel Jensen created this very cool miniature Alice in Wonderland Tea Party. Click the link for many more pictures. Jensen's site is very cool, although I have to admit that I'm a sucker for miniatures. Look at these cakes!!! How does she do it? My dear readers, now that I'm not posting every day, I have a SERIOUS BACKLOG. Here are some beautiful Alice in Wonderland themed cards. Interesting White Rabbit candle stick. Some Alice inspired Storyboards. Also via. Check out these cool rings on this Brazilian site (in Portuguese). 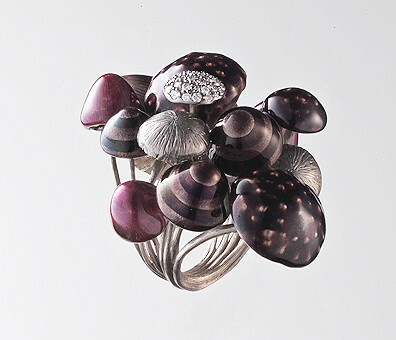 They have mushroom rings, topiary rings, and even a Cheshire Cat ring. They look a bit impractical, but they're really beautiful. An interesting article with a feminist take on Linda Woolverton's script for the Tim Burton movie. I think it's pretty interesting and worth a read. One of my favorite parts in the movie is where Alice makes friends with the Bandersnatch, and the author talks about that a little bit. I mentioned this site before - Alice in Wonderland Challenge - which is an Alice in Wonderland inspired craft blog. From the Almost Alice OST Soundtrack.